For someone who is not a programmer or is starting how can he/she contribute to Drupal.org? I have been talking to people who are starting in the university about Drupal. But they are beginners in programming. so they told me how they can contribute to Drupal or being more involved. What would be the best advice for them to contribute..or how they can start if they have limited program skills? Do you have any advice? Both @David and @Patrick have put it well, on the ways to contribute to the Drupal community. 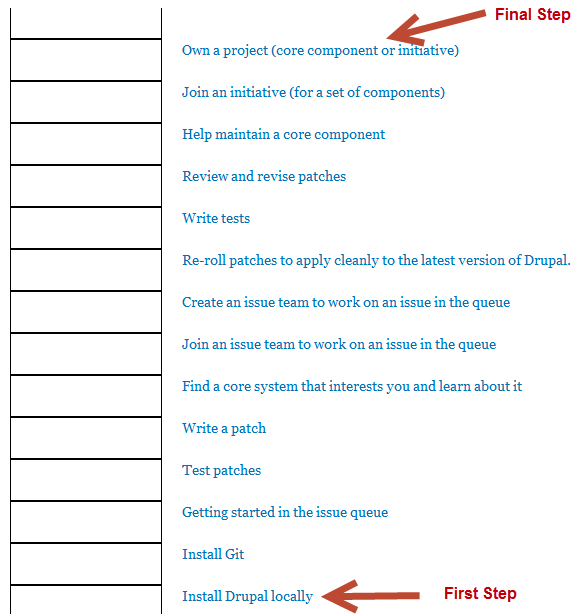 I think a good place to evaluate yourself and then start contributing would be at Drupal Ladder. It was a result of the work from the guys from Boston, who came together and started something called Boston initiative where they come together and work on contributing. If one wishes to contribute, s/he is suggested to follow this steps starting from bottom and climbing the ladder one step at a time. For more, you can also view the session about Drupal ladder at DrupalCon Denver. P.S. : The Drupal Ladder was designed to encourage users to contribute to Drupal core and not did not focus on contribution towards the modules (contributed). There are many ways to contribute to the open-source Drupal project. I am not much of a programmer myself, but one way I contribute is to read through the issue queues of contributed modules that I have experience with. In the issue queues, there are many support requests from inexperienced Drupal users that I am able to answer, even without programming knowledge. I would imagine that the module maintainers appreciate this, because I bet that they would rather spend their time improving their modules than answering basic questions from new users. To get started, check out the guide for how to use the issue queues. Lullabot has an article about why writing documentation makes a great deal of sense for beginners in Drupal and/or development. Triaging large issue queues by identifying duplicate issues and issues that are filed against the wrong project, and following the guidelines for helping maintainers is always helpful and almost anyone can do it. Not the answer you're looking for? Browse other questions tagged 7 community-official-site or ask your own question. How to get the users who did not submit articles? How to reduce support request comments about a module on its official documentation pages? How can I get a list of the patches I submitted for issues on drupal.org? What is the process to upload custom drupal themes to Drupal.org? What is relevance of “PayWithPaytm”?